A very rare and popular amulet for Serm Duang, Maha Pokasap, Serm Yos, and Klaew Klaad Kong Grapan, from the great Luang Por Tarb, of Wat Grabok Kheun Pheung. This amulet is also beloved by devotees of Luang Phu Tim (Wat Laharn Rai), who was present to join Luang Por Tarb for the empowerment ceremony. The amulets were made in a number of different Pim, includiing Luang Por Tuad, Nang Kwak, Roop Muean Luang Por Tarb, and other Buddhist Images. The Muan Sarn Sacred Powders contained the following; Pong Wised Gao (old sacred powders from Luang Por Tarb's repository) 2. See Pheung Khiaw Luang Por Tarb, 3. Pong Bpathamang and Pong Ittijae from Ajarn Pathom Arj Sakorn 4. Pong Thaan Kampir Bailan (Parchment Grimoire soot) 5. Pong Wised special powders from Luang Phu Bun Mee of Wat Po Sampant, and 6. Pong Din Mongkol of Luang Por Tarb. The See Phueng Khiaw Green Prai Oil Potion used to mix with the Muan Sarn powders of this edition is a legendary substance in itself, and is one of the most highly preferred See Pheung Potions with serious aficionados of the 'Krueang Rang' talismanic amulets Genre. Luang Por Tarb used the See Pheung to mix with all of his Sacred Powder amulets, which has made them a Genre of their own, with a very devoted following of devotees and collectors who value the magic of the Pra Pong Pasom See Pheung Khiaw amulets. The front face of the amulet features the image of Luang Por Tarb, within the classic tapered arch we have all come to know as the classic 'Pim Tao Reed' clothes-press shaped amulet which has come to be synonimous with Luang Por Tuad. This series featured Luang Por Tuad Tao reed amulets, and so the Roop Muean images of Luang Por Tarb were made using the same shape and style as the Luang Por Tuad models, to remain in style with the edition. There were various sizes of Roop Muean and LP Tuad models, all of which are now very rare, and immensely sought after acquisitions. Although it is still sometimes possible to find the odd amulet of Luang Por Tarb, it is becoming ever rarer these days to see one in circulation in the Public Amulet Exchanges, and one can definitely say that his amulets are amongst the rarer ones to see in the present day. This series has always enjoyed extreme popularity, as the Pra Pong Pasom See Pheung Khiaw series amulets of Luang Por Tarb, are considered very powerful Metta, Maha Lap, Klaew Klaad and Kong Grapan Chadtri magic. Luang Por Tarb (2420 - 2518 BE), was a Master Gaeji Ajarn Guru Monk of Yesteryear, famous for Metta Mahanyom Magic, and a well known companion in Magical Studies with the Great Luang Phu Tim, of Wat Laharn Rai. Pra Kroo Athagosol or better known as 'Luang Por Tarb', of Wat Mai Grabok Kheun Pheung, in Ban Kaay, Rayong, was born in Ban Na Dta Khwan, Tambon Na Dta Khwan, Amphoe Mueang, Rayong Province, on a Friday of the sixth lunar month of the year of the Ox, in the Year 2420 BE. 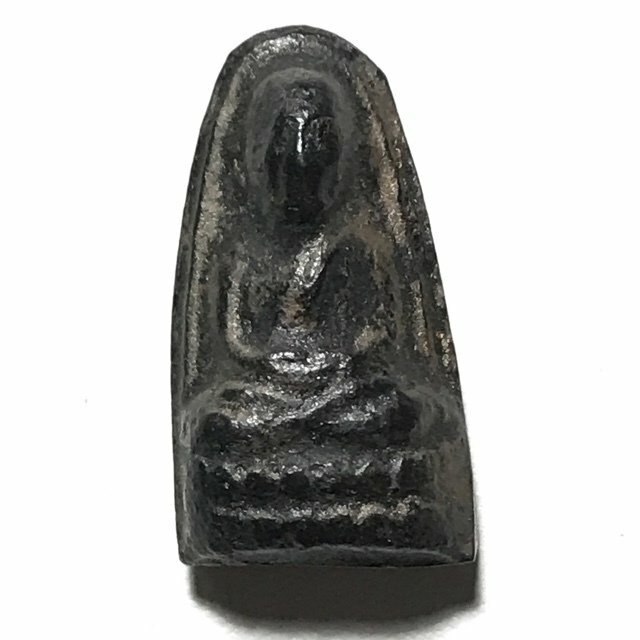 The Powerful Metta Maha Sanaeh Magical Wicha of Luang Por Hyaeng, inherited by Luang Por Tarb is part of the reason why the amulets of Luang Por Tarb are also of strong Metta Maha Sanaeh leanings. For indeed, they utilize the same Wicha, of Luang Por Hyaew, who received it from the long line of his preceding Masters. In the end, all the Wicha which are passed down from Kroo Ba Ajarn to their Apprentices, who in turn become great Masters, and pass it down to their apprentices, are Ancient Wicha, which have survived for centuries, and some for even thousands of years. We are blessed to be able to still enjoy these authentic Ancient Wicha of the Thai Buddhist Sorcery Transmission Lineages in the Present Day. During his years of on Tudong, Luang Por Tarb gathered many herbs and magical substances which he would seek and find in the forests, according to the formulas he had learned from Luang Phu Hyaew. His Tudong wandering took him as far as Cambodia and Burma, and his time of wandering lasted for many years, as he gathered and stored as many rare and powerful magical plants and substances, which he would then put in his repository every time he returned to his temple in the rainy retreats. After many years, Luang Por had managed to gather the full formula of different herbs, roots, vines, flowers and pollens necessary to fulfil the Wicha and complete the formula he had inherited from Luang Phu Hyaew. Once his wandering was over, he returned to the temple and took all the herbs roots and plants he had gathered and dried out in the sun over the years, and ground them into Muan Sarn Sacred Powders, to mix into See Pheung Waxy Balm Potion. This potion was of course the legendary See Pheung Khiaw of Immortal Fame and Reputation. The See Pheung is green due to the formula of herbal ingredients from the ancient recipe given by Luang Phu Hyaew. The Wicha is predominantly Metta Maha Niyom and has gained a very high reputation for attracting good business and good relations with others. The thing which caused Luang Por Tarb to become Nationally and later Internationally famous for his Powerful Metta Mahaniyom Magic, was of course his Legendary See Pheung Khiaw Green Prai Oil Balm. Luang Por began to make the See Pheung Khiaw at about the age of 80 years old, after 4 years of gathering and formulating the various sacvred Muan sarn Ingredients and Herbs for the making of the Potion. Luang Por Tarb began to become popular with the local devotees, and news of his powerful See Pheung travelled further afield, until devotees began arriving from distant towns and villages to ask for his See Pheung Khiaw potion. Luang Por Tarb became increasingly popular as news of the effectiveness of his See Pheung got out, and when the Abbot of Wat Mai Grabok Kheun Pheung passed away, the Devotees begged Luang Por Tarb to take up the task of maintaining the Temple as new Abbot. Luang Por Tarb was unable to refuse their needs, and accepted the task. He fulfilled his duties with rapidity and easy by constructing Kuti monk residences, Vihara shrines, Uposatha Chapel and other great achievements. This increased the faith and popularity of Luang Por Tarb, which began to reach far further afield to other Provinces around Thailand. In 2481 BE LP Tarb was raised in status to the rank of Jao Kana Tambon (Bishop of the Municipality), and in 2490 BE, he was awarded the Royal Decree of the title of Pra Kroo Sanyabadtr. The See Pheung Khiaw of Luang Por Tarb became so popular in those days, and was so hard to get Luang Por Tarb to hand some out, that Devotees would sometimes have to sleep at the temple waiting for a few nights, to prove they really needed it, before Luang Por Tarb would allow each devotee to take just a tiny dab of See Pheung with them. The devotees would often encase the See Pheung in gold casing or waterproof casing, to carry with them and pray to. Its powers are undoubted for the simple fact that there are so many reports and stories which came back to the temple from so many devotees, that the power of the See Pheung Khiaw was undeniably recognisable. The Pra Pong Pasom See Pheung Khiaw amulets were based in a mixture of sacred Muan Sarn mixed with See Pheung Prai Oil Balm, and made in various colours of clay, mostly black, but also seen in red and beige and gray tones. The below picture shows just a few of the many pim he made. Luang Por Tarb made many different amulets during his trajectory as a monk including Rian Guru Monk Coins, Pha Yant Pat Boke, Pra Pong (Sacred Powder amulets) usually mixed with his See Pheung Khiaw, Takrut and other talismanic charms. His Pra Pong powder amulets were made in many different Pim, including the Pra Gleep Bua, Pra Pid Ta, Pra Somdej, Pra Roop Muean, and Pra Nang Kwak. Luang Por Tarb's See Pheung Khiaw is extremely rare, because Luang Por refused to distribute during the latter part of his life, for fear of its power being abused. The Pra Pong Pasom See Pheung Khiaw amulet series was released in the year 2505 BE, in the 'Phuug Putta Sima' Temploe Boundary Installation Ceremony at Wat Grabok Khuen Pheung. The Muan Sarn Sacred Powders were mixed with See Pheung Khiaw, with Luang Por Tarb presiding over every single stage of the process, and defining every detail of the mixing of the sacred clay. Luang Por Tarb controlled the whole process starting from the empowerment of the Mae Pim Block Press Mold right up to the final Buddha Abhiseka Blessing Ceremony. Luang Por Tarb also invited the great Luang Phu Tim of Wat rai Waree (the earlier name for Wat Laharn Rai), to assist in the empowerment in the Buddha Abhiseka, as both Monks were intimate colleagues.Other monks he invited to attend were Luang Por Horm of Wat Sak Mak, and Luang Por Hiang (Wat Pha Chonburi). The Buddha Abhiseka Blessing is still famous to this day for the fact that it continued throughout the day and night to the next dawn. It is also said that various mysterious events happened during the ceremony, which local devotees still talk about to this day. Many amulets were distributed to devotees during the ceremony, and the remaining amulets were hidden and stored within the cement arches of the temple boundary, and within the roof of the shrine room. Luang Por Tarb passed away in the Year 2509 BE, at the age of 89 years old, leaving us with many legends told during his lifetime of his merits and his powerful magic, and with the legacy of his See Pheung Khiaw, Pha Yant Pat Boke, Pra Somdej See Pheung Khiaw, and Pra Pong Dam amulets, amongst others, to remind of that there was once a powerful Sorceror Tudong Master, who walked the earth, with Immense Metta Mahaniyom, whose name was Luang Por Tarb.